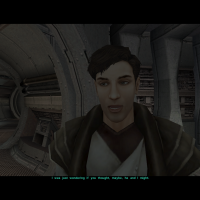 In KotOR II: TSL, certain party members can develop romantic feelings for the Exile, even though none of the romances in TSL were given much development, especially if compared to the first KotOR game. Among the possible romance options, Atton flirts with and expresses romantic interests for female Exiles only. What this mod do is to change the gender check of Atton's flirting and romantic dialogue, so he will express interest in male Exiles as well. Please note that this mod is ONLY COMPATIBLE WITH THE ENGLISH VERSION OF TSL AND TSLRCM. I do not provide support for non-English versions of TSL and TSLRCM. First and foremost, make sure you have The Sith Lords Restored Content Mod (TSLRCM) installed since TSLRCM is REQUIRED for this mod to work. Option A: This option will make Atton express interest in both male and female Exiles. Option B: This option will make Atton express interest in male Exiles only, and Atton will not flirt with a female Exile. Once you have chosen the installation option you want, point the installer to your KotOR 2 directory and let the installer do its magic. If you want to use any of the above mod alongside this mod, go to the "Compatibility Patches" folder, and follow the instructions written on the ReadMe files contained in the subfolders. NOTE 1: During installation, a new folder named "backup" will be created by TSLPatcher in the same folder as the TSLPatcher. Do not delete the folder or any of the files within the folder if you are planning on uninstalling this mod. NOTE 2: The "Source" folder includes the source of the scripts used by this mod for modders' reference. Ignore the "Source" folder if you only want to install and play this mod. 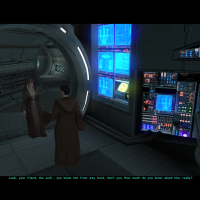 Step 1: Go to the "backup" folder created by the TSLPatcher from this mod, cut and paste 003EBO.mod, 101PER.mod, 102PER.mod and 904MAL.mod into the Modules folder in your KotOR 2 directory. 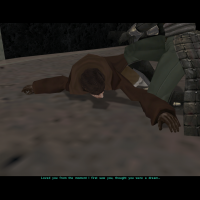 Step 2: Go to the Override folder in your KotOR 2 directory and delete 101101atton200.lip, gblbaodur501.lip, gblbaodur502.lip, gblbaodur503.lip and gblbaodur504.lip. Step 3: Go to your game's StreamVoice\101\101atton directory and delete 101101atton200.mp3. Go to your game's StreamVoice\GBL\BAODUR directory and delete GBLBAODUR501.mp3, GBLBAODUR502.mp3, GBLBAODUR503.mp3 and GBLBAODUR504.mp3. 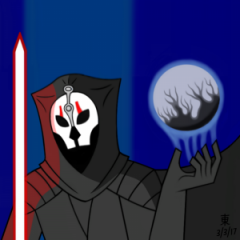 If you want to use DarthTyren's PartySwap mod alongside this mod, you must install this mod AFTER PartySwap, otherwise you'll miss out certain Atton romance content when you're playing as a male Exile. You may use this mod as you see fit, including showing it in screenshots or making it compatible with your mod. However, please give credit to me, and DO NOT release your mods containing modified files from my mod without my permission. Thank you. 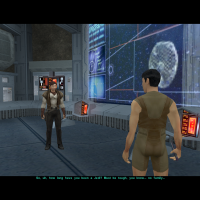 In the cutscene of Atton repairing the Ebon Hawk on Dxun, a dialogue of Atton flirting with the Exile is now available for male Exiles. I think my username sufficiently shows how much I love this mod.